Update: If you’re the owner of a Danby Danby DKC645BLS and can no longer control your temperature or are getting flashing “EE” errors, see the additional question answered below. Possibly because the number of craft breweries is exploding, possibly because of the economics of scale and possibly just because beer is delicious, a lot of people have been asking me about buying a kegerator. Since we got ours in February of 2012, we’ve had a lot of interesting things on tap at the house. Allagash Bourbon Black, Dogfish 120 Minute, Lost Abbey Deliverance, a hell of a lot of Curieux and even some Zymatore Bourbon Aged Alvinne Melchior. All of these have been significantly cheaper in keg form than they would have been in bottles, and some were never available in bottles in the first place. All of which is a long way of saying, almost two years later, we’re very happy with the purchase. But many of you remain unpersuaded by the stock “go buy one” recommendation, and have actual questions about getting, owning and using a kegerator. If you’re one of those people, this is for you. The Amazon links below are affiliate links, just FYI. Q: Do you end up drinking more beer if you own a kegerator? A: At first, yes. The novelty of being able to pour your own drafts at home is huge. I drank way too much Weyerbacher Heresy the first night we had ours. After a week or two though, no. I compare it when people ask me this to a water view: it’s something you appreciate, but also something that fades into the day to day background of your life. Add in the fact that sixtel kegs don’t contain as much beer as you might expect and the answer is no, after a little while, a kegerator is unlikely to have a meaningful impact on the amount of beer that you drink. A: A sixtel is 1/6th of a full keg, the most common size you’ll find for home consumption. A full sixtel weighs around 58 lbs and contains 55 12 oz pours of beer, per Micromatic. Pony kegs are the next size up, and represent a 1/4 of a full keg. They weigh just shy of 90 pounds and contain 82 12 oz pours. A full keg, or half barrel, which you’re not likely to need unless you’re throwing a large party, weighs over 160 pounds and contains 165 12 oz pours. But again, if you’re a craft beer fan, you’re probably going to be dealing primarily with sixtels. And when you have a bunch of friends over, you’ll be surprised at how quickly you can go through 55 12 oz pours. Q: How long do kegs keep? Do I have to drink them right away to prevent them going bad? A: The design of the kegerator insures that no air actually ever touches the beer – only CO2. This means that as long as you’re using a keg on the kegerator only, it will keep as long as the beer will. If you’re an IPA fan, you’re probably going to want to blow through the keg very quickly because the hops will fade in a matter of weeks, washing out the taste. If you’re into sours, or dark, higher alchohol beers, you can store these for years. Many of these will taste better, in fact, if you age them. We’ve got a couple in the basement, in fact, that are around a year and a half old. Q: Where does one buy kegs? A: From a liquor store, naturally. The challenge will be finding one that will actually tell you what kegs they have available. For reasons that have never been clear to me, many liquor stores will not be able to tell you what kegs they can sell. They’ll answer your question – “what do you have?” – with their own, “what do you want?,” failing to realize that the answer to the latter depends heavily on the former. We’re very lucky to have Bier Cellar here in real Portland, and Greg does an excellent job of keeping his keg lists up to date. If you’re down in the Boston area, Julio’s lists theirs as well. In other cases, hit up the best craft beer venue nearest you. If they don’t sell kegs themselves, they might be able to give you a line on where to get one. Q: What kind of kegerator did you buy? A: We bought a Danby (my Amazon review here). Nothing has changed since that original review, either: the kegerator has, in general, been issue free. One review, however, suggests that our specific unit has been discontinued. So that might be a problem. Q: Where did you buy your unit? A: Amazon. The Prime free shipping was too good to pass up. Q: What should I look for in a kegerator? Find one that has a full 5 lb CO2 tank. Many come w/ a 2.5 lb tank, and that will make it harder to get CO2 because the most common distribution model is straight trades of 5 lb tanks – i.e. they don’t fill it, but you leave your empty one and they give you a full one in return. Don’t pay a premium for multiple taps. As long as you get a reasonably sized unit (like the Danby we got) that can house multiple barrels, you can always upgrade to multiple taps later, more cheaply and with better equipment. Even if you don’t want multiple taps, getting a slightly larger unit is recommended because you can accommodate more types of kegs beyond the normal sixtels (1/6 of a keg), such as quarter (pony) or even full half kegs if necessary. Temperature control: try and find one with the ability to easily set and control temperature. The colder the kegs are kept, the less likely you are to have foam issues. Q: How much does it cost to operate a kegerator? A: Electric costs, at least for our model, are marginal. The Danby we have will theoretically operate for a year for around thirty dollars of electricity. Q: Do I have to cover the lines to protect them from fruit flies? A: It’s recommended. Get one of these for a couple of bucks and you’re all set. 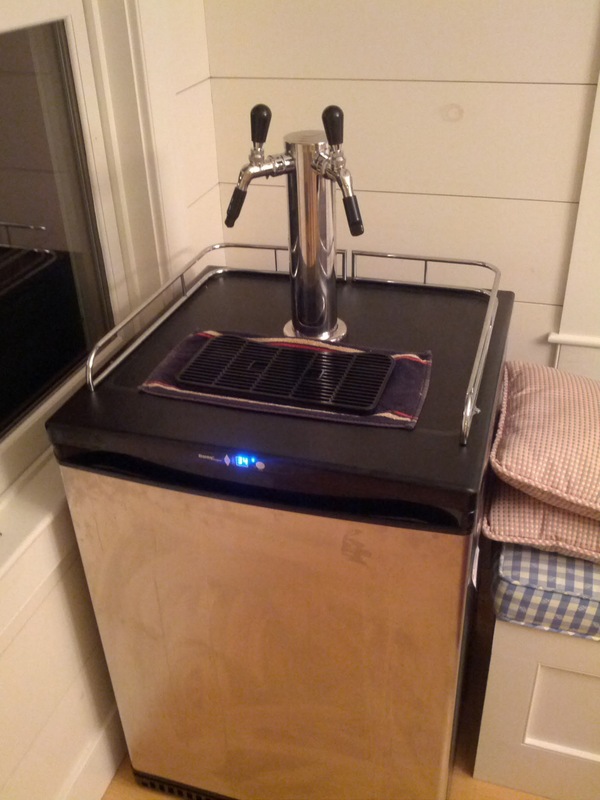 Q: Will my kegerator be compatible with any keg I buy? A: Sadly, no. The overwhelming majority of kegs will be compatible with the standard coupler that comes with a kegerator, called a Sankey coupler, but some kegs – particularly European ones – will require a different coupler. That said, if you’re set on a particular keg, swapping out a coupler for a different style takes maybe five minutes. Q: How about set up? Are kegerators hard to put together? A: It might seem complex at first but it’s not mechanically challenging. If you think of a kegerator simply as a fridge with some hoses to hook up it’s easier. Basically you screw the faucet/tap into the refrigerator unit, screw the seating assembly for the tank onto the unit, connect the hoses and clamps to the regulator (CO2) and the keg coupler and you’re done. You’ll probably want something sharp to trim the lines, if necessary, along with a screw driver and a monkey wrench. Q: Where do I fill the CO2 tanks? Or trade them? A: For CO2, the easiest place to find it is at your local brewing supply place – in my case, that’s going to see Rob at Maine Brewing Supply. If your local supply place doesn’t have it, they’re likely to know who will: some kegerator owners have to go to medical oxygen supply houses for their gas. Q: I bought a Danby DKC645BLS but can’t control my temperature, am getting a flashing “EE” error and the unit is making loud beeping sounds. What do I do? A: The bad news is that, in all likelihood, your display board is fried. The good news is that it’s easy to fix. Though the unit is no longer manufactured by Danby, you can purchase a replacement part here. From there, it’s three screws from the back of the kegerator to remove the top of the unit and expose the board. Disconnect the various connections for temperature sensors, etc, and unscrew the two screws holding the board in place and remove it. Reverse the process, power the unit back on and you should be back in business. Other questions? Things you need to know before buying a kegerator? Leave a comment and I’ll answer it if I can. As it turns out, welding and fire-extinguisher supply stores are also great for CO2, and may be willing to trade you up to a 5 lb tank at a reasonable price if your kegerator came with a 2.5 lb. Re getting kegs, many of the local places here don’t stock them and have to check with their distributors to see what they can get that isn’t set aside for bars. That’s a real limitation. Bit of a nit but 1/6 and 1/4 are fractions of a barrel, not a full keg (which is 1/2 barrel). The respective proportions of a full keg would therefore be 1/3 and 1/2. Yes, I like the Danby line of kegerators too. I also have been amazed at how many beer distributors here in upstate NY don’t have an inventory system. How do they stay in business? Anyway, great article for people to read to get filled in about keg cooler ownership. One tip for people that aren’t handy with tools, for the first time hook-up. Knock on your neighbors door and ask for help. When he hears you need help with your new kegerator, I can assure you that he will be willing to help, and who knows, you may have just made a new drinking buddy! My wife bought me a kegerator and it came with a 2.5 pound CO2 tank. I replaced it with a 5 and one gauge on the reg stopped working. Did I cause the issue or shouldn’t both tanks be the same pressure because it is liquid and the vapor pressure should be the same for either tank as a function temperature not of the amount of liquid, right? Second question; I only have room for one keg. Can I keep on in my garage fridge and rotate kegs back and forth as long as I keep the cold? you can definitely store your kegs in your garage fridge totally fine. You can even have them not be refrigerated and still usable, but I’m not sure what the shelf life of that would be. We had our fridge unplugged over the weekend one time by accident and the beer was totally fine – air and light are the biggest culprits for making beer go skunk. Great information. I am having a house built and I will be a first time kegerator owner. Should I have a drain line installed by my plumber during construction? Thanks. @bryan – it really depends on if you don’t think you’re going to move your kegerator or not in the future. it’s definitely a handy thing to have so that your drip tray can be setup up to drain to, well, your drain. For a kegerator, I don’t think you would necessarily have it hooked up directly to a drain but on certain models the drip tray will have a tube connected to the underside of it which will then funnel out somewhere else (the back usually, i think) which then you can have go to your drain. I would just the drain at least somewhat accessible so that you can get to it easier to clean. We don’t have our drip tray going into a drain b/c of the contractors lack of communication and not letting us know what the hell they were doing with our bar area, but that’s beside the point. When you’re pouring more beer than some restaurants on a weekly basis, that drip tray is definitely nice. Great Post. Some solid advice about buying a kegerator. I like the advice on buying the 5lb Co2 tank. Many people dont realize the difference between the 5 and the 2lb’er. Was looking for ideas on content for kegs and your post is great food for thought. Cheers! So I have been looking into the nostalgiaKRS2100 on this site Topkegreview Change and I was wondering if any one had any experiance with the model… any trouble? I’ve had a KRS-2100 for 5 years and am quite happy with it. I upgraded the CO2 tank to 5 lbs (a bigger one still fits with a full keg) and switching the faucet to a less drip-prone Perlick.